Managing your time means to be in position to dominate the time and your work rather than being dominated by them. Your time is your life. Every thought and every action you make takes time. Therefore the way you use your time automatically determines where and how to use your life. The great paradox is that nobody has enough time, and yet everyone has as long as there is. Many of the time consuming factors affecting people cause stress and anxiety, so these factors must be identified and limited. If you have more time for work you have more chances for success. If you have more time to think you can utilize your mind better. If you have more time to play, you can enjoy your life better. If you have more time to read, you can gain more knowledge. If you have more time for being friendly, the happier you will be. If you have more time to love, you will feel more joy. If you have more time to enjoy, the better is for your health and soul. Clarify your short term-goals and priorities on a daily basis, as well as your long-term objectives. Allocate enough time for planning. One hour of actual planning can save you three to four hours of work. 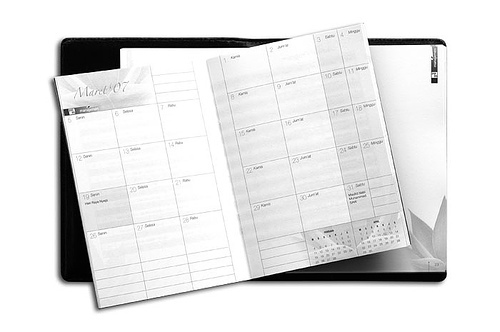 Write your daily and weekly activities in a schedule with priorities and the time required for implementation. Place your schedule somewhere where you can see it all the time. Avoid the tyranny of urgency. Concentrate on the most important issues of your work. Without goals, you cannot know what to do. Without a schedule you cannot know, when to do so. During the meeting, make sure that the meeting starts on time. Use a meeting schedule with a predetermined period. After the meeting, record immediately accurate meeting minutes. Check the progress at predetermined intervals. Minimize interruptions by phone or visitors. Delegate phone calls and visitors to someone else if possible. When you are searching for someone, try to setup a predefined time to call him/her. During a phone call, try to use various tricks to stop unnecessary debates. Close the door of your office. The policy of «open door» means you are accessible for passers-loafer. Remove from your desk everything except the things you need for your specific job. Create folders (binders) where you can keep the documents for each task until you need them. Only put the file(s) that you need in your desk. Discard the rest. Delegate to others, if possible, all the «paperwork». Do not leave your tasks unfinished. If possible finish completely a task you have started. You must understand that the time you will invest to train someone to do a job will benefit you many times in the future. Do not do anything you can assign to others. Find the most appropriate person, if possible, for the work you do not want to do. Provide clear written (if possible) instructions. Give greater importance and emphasis on results rather than methods. Get a freelancer to do the work for you. Visit Freelance Writing for Beginners to get some ideas. Make the most important jobs first. Those you cannot do are automatically second priority. Start the job on time and try to make it right from the beginning. Try to avoid mistakes so as to win the time of recurrence. Keep your selfishness balanced, your excessive ambition and your confidence too. Consider that if you restrict your workload, you will do your job better. Saying, «yes» in various requirements would rather lose and not win the respect others have for you. Record everything during the day. Include all the breaks and interruptions. Use symbols and abbreviations for repetitive actions such as telephone calls etc. Put priorities in all tasks. At the end of the day check how much time you spend on each high priority task. Add comments on every task on how this can be improved in the future. I loved your article, great tips. I used it to prepare my persuasive speech on time managment. Thanks a lot.